Colleen Kinyon is the container gardener guru. She is a Landscape Designer and Garden and Property Manager for Torrison Stone and Garden at 422 Main Street in Durham. The Wallingford Garden Club loved her dynamic presentation and slide show on container gardens and gardening smarter. Along with many photos of garden examples that employed unusual mixtures of plants, she brought along several examples of containers to use for succulents, tropicals,and perennials. She encouraged members to branch out as to what they used in container gardens, and not use only annuals. To add texture and color, Colleen suggested using ferns, bulbs, grasses, sedums, succulents, vegetables and flowers in these container gardens. And to make gardening easier, use potting mix that is formulated to retain moisture so plants survive dry periods better and require less watering. In addition, perennials can be saved and used in following years, thereby saving money and time hunting for more plants. Using some plants with bright shades of pink, coral and red flowers will attract butterflies and hummingbirds. Hanging a hummingbird feeder over the container is a lure for them to your container. Using objects in a planter, like a trellis, tuteur, and metal objects creates interest and a place for plants to grow into. Her whole concept was to enjoy gardening, save money and time, and delight in nature. Colleen demonstrated how to make a mixed container garden and then the Club raffled off two containers that Colleen made. A special treat to members were the several plants and seed packets that Colleen gave to members. 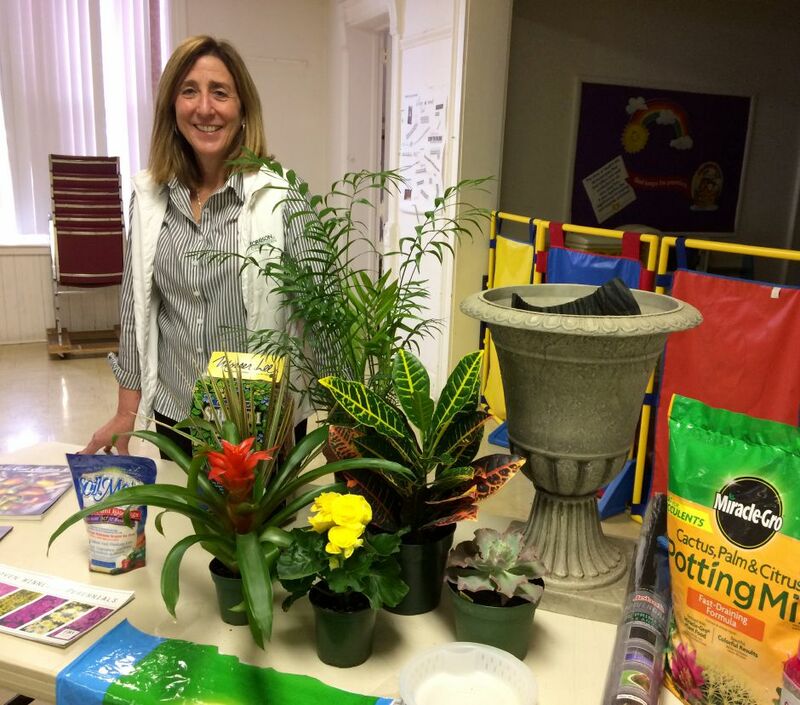 So, despite the winter weather, Colleen inspired members to think ahead and plan for spring.Pictured is Colleen Kinyon prior to putting a container garden together.